and we were all so happy they were finally here! The Carver's are living in the apartment next door to us above the office. They were able to rest a little before joining us for dinner and visiting at the Mission Home. They had a long and tedious journey since Friday when they left the Provo MTC, and they are still so cheerful and positive!! Elder and Sister Carver are being trained to take over for Sister Hays and I in the office. We are so glad that we have a few months with them for this transition. Our weeks are busy, and we don't always have tons of time to stay in the office...something else is always needing our attention. One day we had to go north to check out a new place for elders to live. After a look around, we decided WE wanted to move into this home! 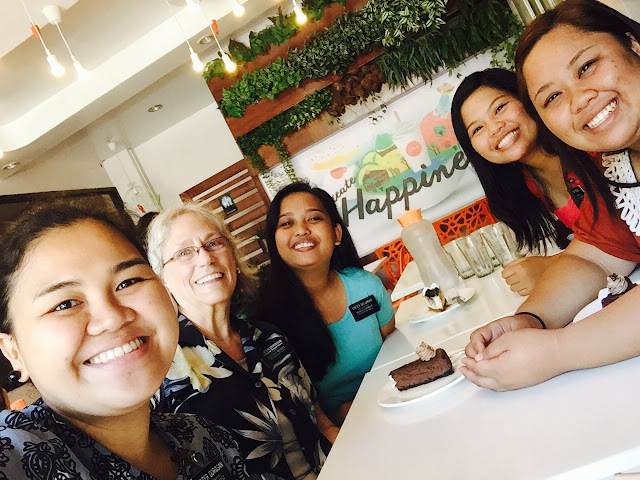 Look at these happy faces!...Elder De Guzman, Escoto, Paguigan, and Fuifui. We call this the "beach house". It is a giant home on the beach. As it turns out, the owner is sectioning the home into two separate spaces. The Elders will live on the main level. 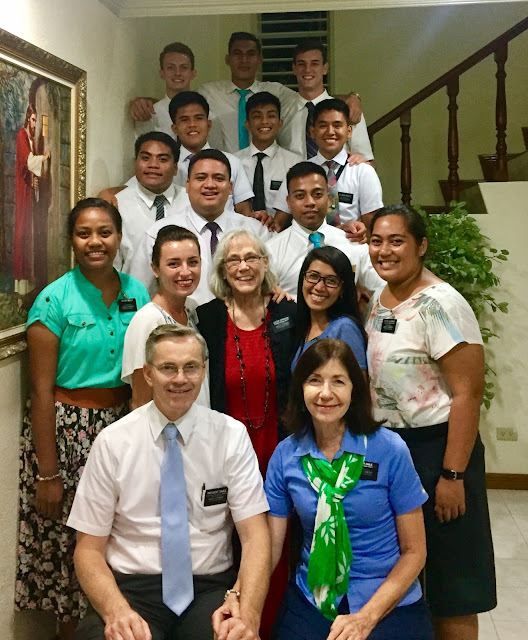 President and Sister Lacanienta served a mission in the Philippines recently and were only home about 18 months before returning to serve here. Because of that, their driver's licenses were expired. We went with them to get the licenses renewed. It was a madhouse and hot, but they survived! 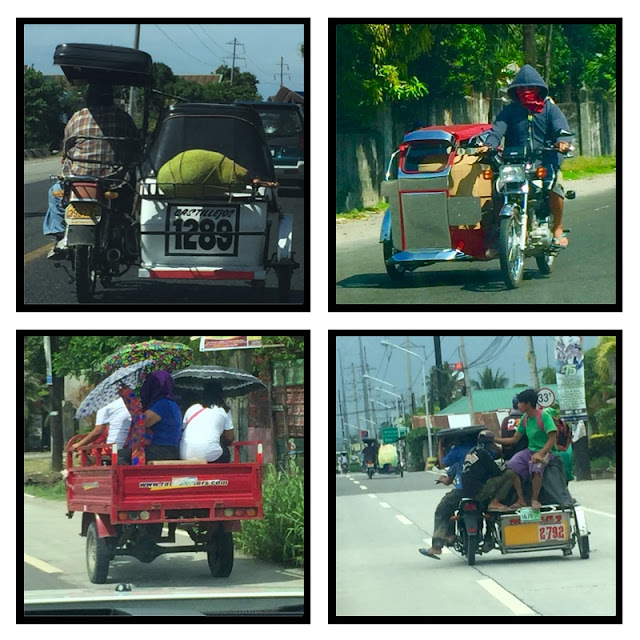 It is never a dull or boring ride when you are in the car on the streets and highways of the Philippines. There is so much beauty to behold...and then there are those things we see and don't quite understand. Much of the Philippines lifestyle is different from home. I know this is to be expected whenever I travel in the United States or far from home. It makes me smile! 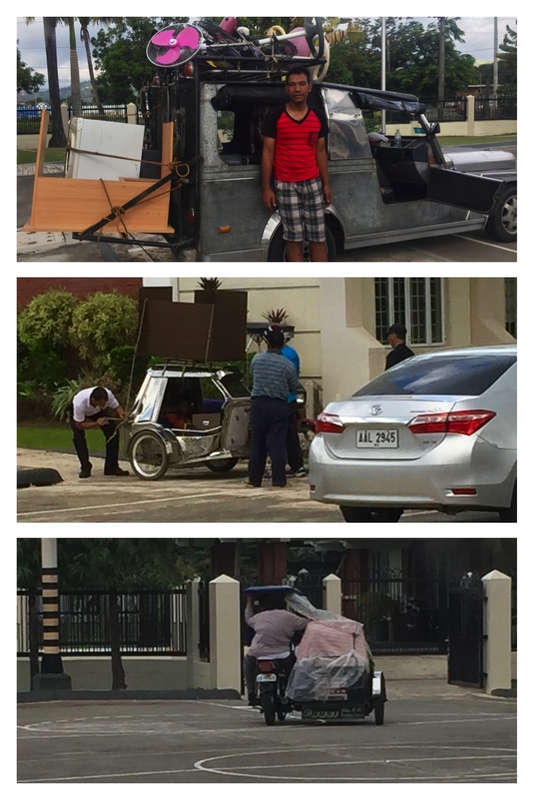 These bottom pictures are show stoppers...Trikes carry all sorts of things from people, animals, and furniture...AND canoes!! The canoe was unusual enough BUT on this rainy day, there were people IN the canoe being carried by a trike! The sideways picture is of pigs either going to market or to home. Pork is a staple food in the Philippines. The last picture is a hilarious protective helmet. I wish I has gotten a closer picture. 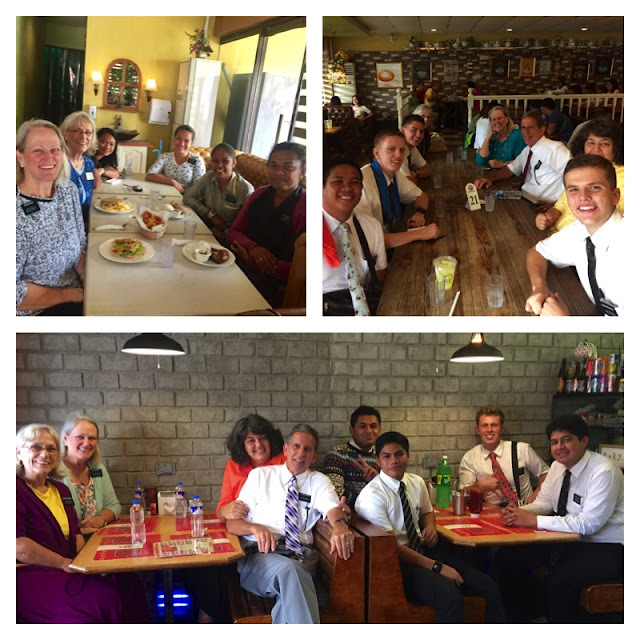 One of my favorite things is to be with the young missionaries. They are always hungry, and we love to take them for a meal and treats! The faces are always happy and they are so appreciative. 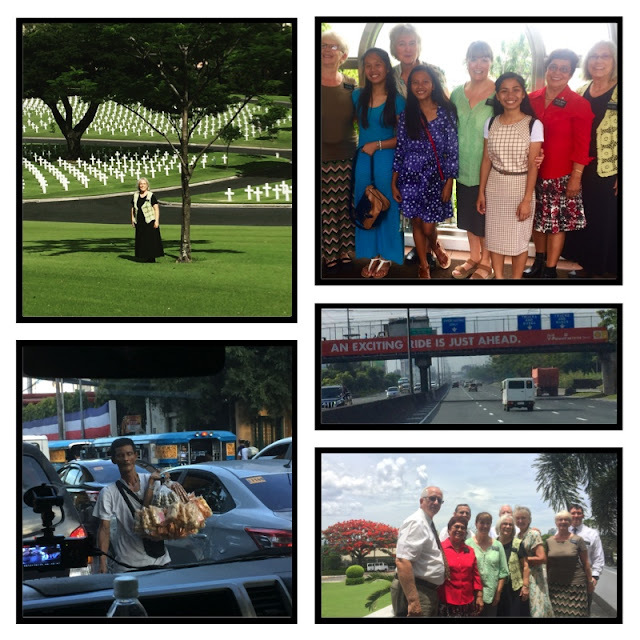 The young missionaries in these pictures are: Sisters Calimlim, Borres, Pagatpatan, and Colati. Elders Zamora, Bulloch, Nelson, and Breinholt. And our Office Elders--Elders Tofa, Abala, Spring, and Magalei. It is rainy season!!! It was full force yesterday with very hard rain and wind for over 30 hours. Elder and Sister Carver were initiated superbly! The Carver's were also initiated to our "no electricity" stand-off's. The electric company is still working on new lines down the highway next to our home. This week that meant we had two 8-5:00 days of no electricity (and no water, internet, or air conditioning). We couldn't work in the office so we all took off and accomplished some of the other tasks that we needed to do. This is a little friend. 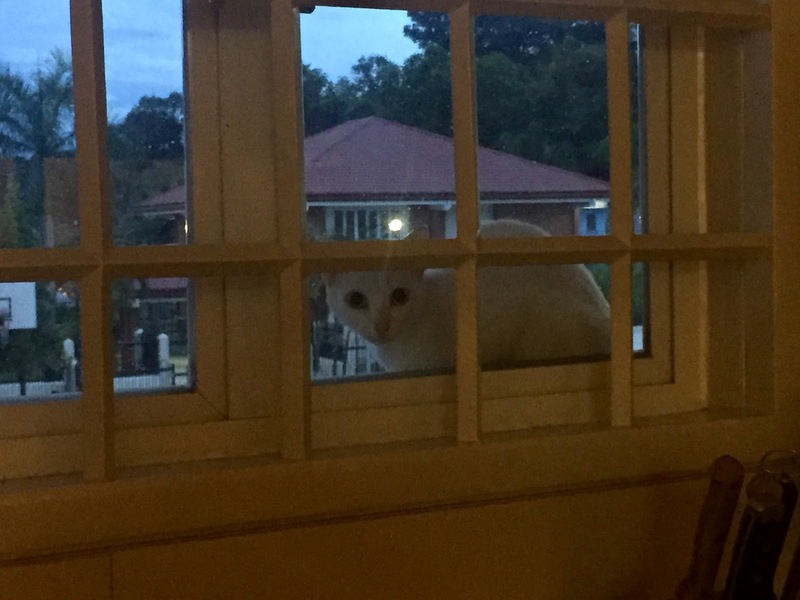 We live on the second floor, and I'm not sure how this cat found it's way to our kitchen window! Just one more thing that made me smile! missions are a lot fun! 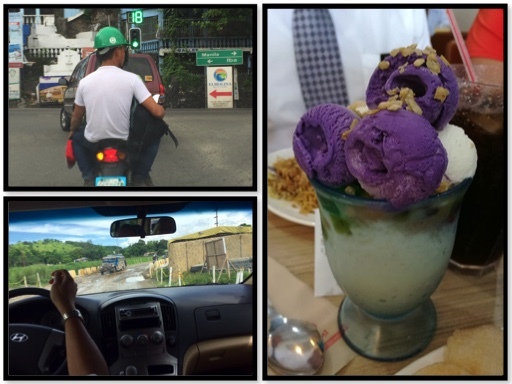 we've had some internet issues and some busy-ness issues this week so i'm a bit slow in getting this out but i begin with some things strictly filipino ... a hard hat that is surely as good as a motorcycle helmet, rainy season roads, and halo-halo (hollow-hollow). okay ... probably a third of the vehicles on the roads here are motorcycles and, if they wear anything at all, there are some of the oddest things worn as helmets that the person obviously thinks will protect them! hard hats are my favorite ... they won't fall off if i crash, right? and one version of rainy season roads ... no explanation necessary! the picture doesn't do the halo-halo justice! it translates to 'everything mixed together' (that's close enough!). let me describe it for you ... in a dish, place a scoop of shaved ice then cover it with sweetened condensed milk. add 3 types of boiled sweet beans/chickpeas, corn, yams, nata de coco (envision coconut flavored gelatin cubes), plantains, mashed sweet rice ... really anything at all that you have on hand! then top it off with, in the case above, ube (oo-bay)(which is like a purple yam) ice cream and some sweetened rice krispies for good measure! just about every restaurant has their version of it. i think it's the nation's favorite dessert! next, we took the newbies, president and sister lacanienta, to a farewell dinner for the perrero's and wright's who were being released. and the reason we are all here ... joy in the work of bringing souls to Jesus Christ! 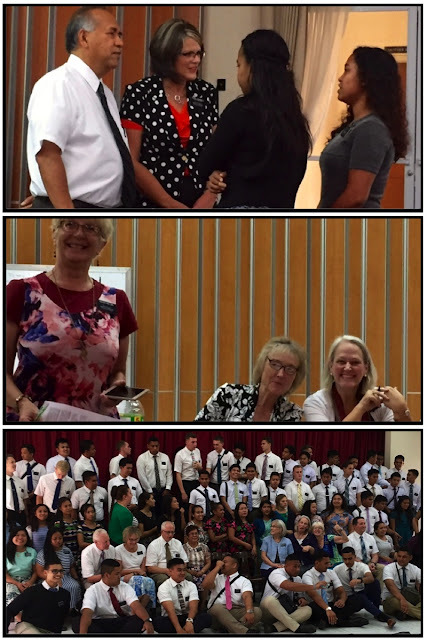 next, we had three days of zone conferences so the lacanienta's and all the missionaries could meet. as has been said before, being with the young missionaries is our favorite thing so these are always great days. our most unique companionship is elder rigby and elder lomibao! they just make me smile! 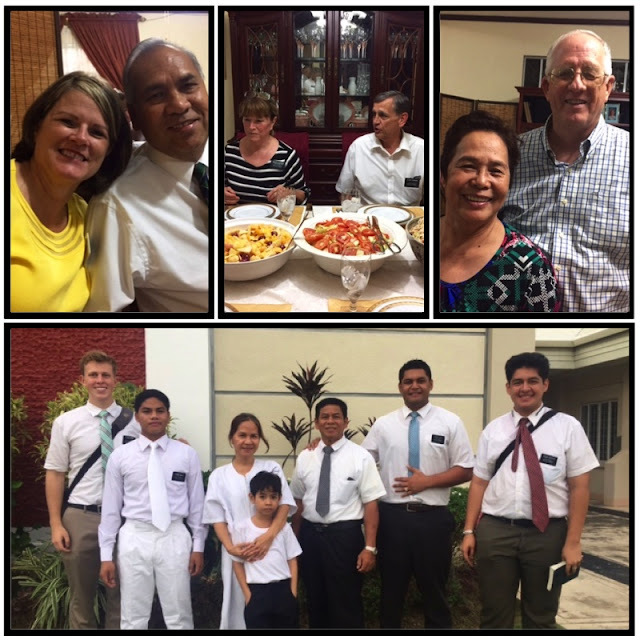 a couple of pics of missionaries waiting for meetings to begin and one of our favorites, elder vaoiva, helping to clean up after a delicious lunch! while getting acquainted was THE highlight, another highlight of the day was that we got to receive flu shots! sister rollins (l) is our mission nurse and sister miller and i handled the paperwork and moral support. some of the reactions were priceless, but of course i felt badly for them! and finally, preparing for zone photos sometimes takes awhile and people with ADD can get a little bored. notice the bad influences in the second row? like i said, missions are a lot of fun! the people i've met will influence me for life. the things i'm learning, about my Savior, myself, the world and life in general are, hopefully, indelibly written on my heart. i'm so grateful to be on this journey! 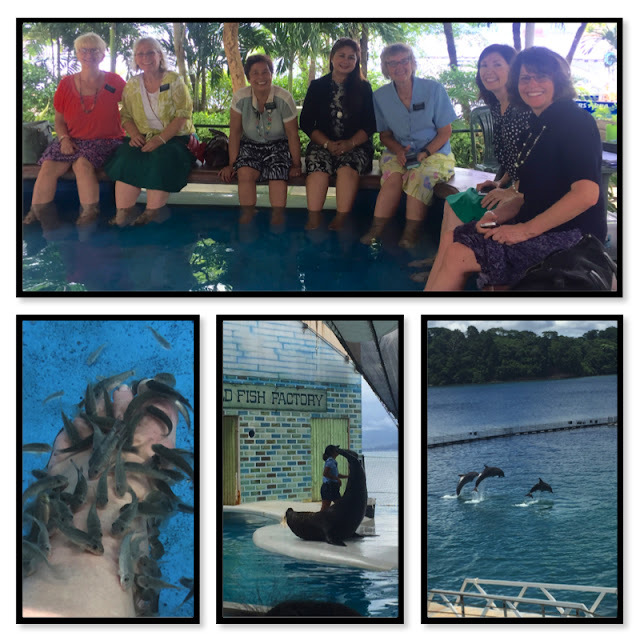 The Photos above: Senior missionary dinner at Texas Joe's, a favorite American restaurant by Subic Bay. 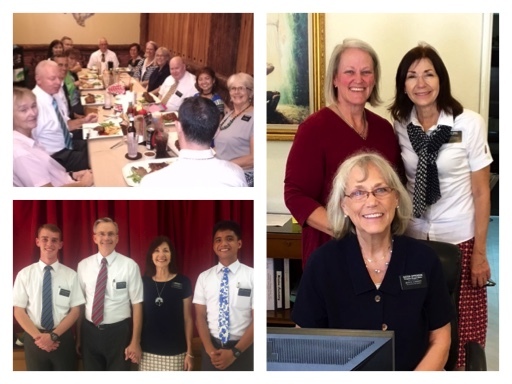 Donna and I in the office with Sister Dahle; President and Sister Dahle photo with the Assistants to the President. This is really happening! As President Dahle told us...when President Lacanienta drives into the Mission boundaries, the priesthood keys for the mission are his, and President Lacanienta is then the Dahle's Mission President. This is our Mission Map and our Branches/Wards as they are today. 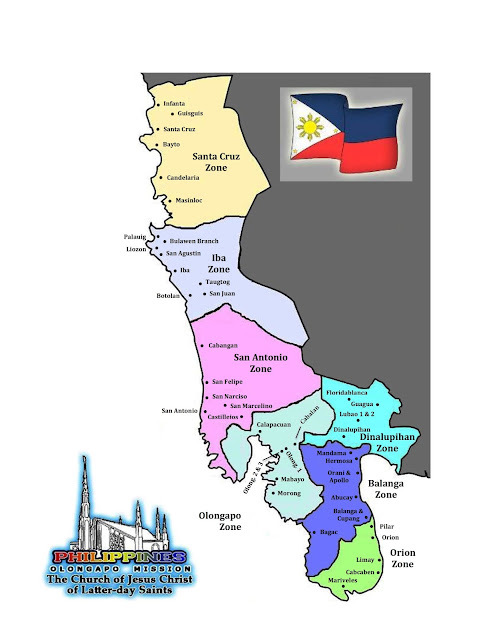 The Calapacuan Ward is where we live, in the Olongapo Zone. The white area of the map is water and the grey area is land to give you a little idea of where we are. We are on the northern Luzon island. Manila is east of us. Not only are we saying good-bye to the Dahle's, but two other senior couples are also being released this week. The Perrero's are returning home on Wednesday after being with us for a year. They have taken care of the missionaries and members in the northern two zones and lived in Masinloc. The Wright's have been serving a live-at-home service mission for over 3 years! They live in the San Antonio zone and have been indispensable! I'm not sure the mission will function properly without them. Actually, it is going to be difficult without both of these senior couples! Quoting a general conference talk..."Even if these seniors don't know the local language, their accomplishments are great and their spirit of sacrifice is precious." Elder Russell M. Nelson. These pictures are some of our sights this past week or so. 1) farm equipment in the road...a familiar scene here or at home. 2) a marker for the 'Bataan death march' from WWII. These markers dot the roads in the southern part of our mission. 3) a bell tower in the Freedom Park in Bataan. 4) one of many mango trees just full of mangos...the best mangos in the world! 5) Elder Poulsen added a necktie to my collection so that I can add it in my necktie quilt from my missions. 6) Jeepney with "Arizona express" on the back flap. The jeepneys have all kinds of signs, but of course, we loved this one! Below are some pictures we wanted to share. The first is our same Elder Poulsen. He was one of our office elders. We visited him the day before his birthday, his 'preparation'-day, to deliver a birthday treat for him and his housemates. 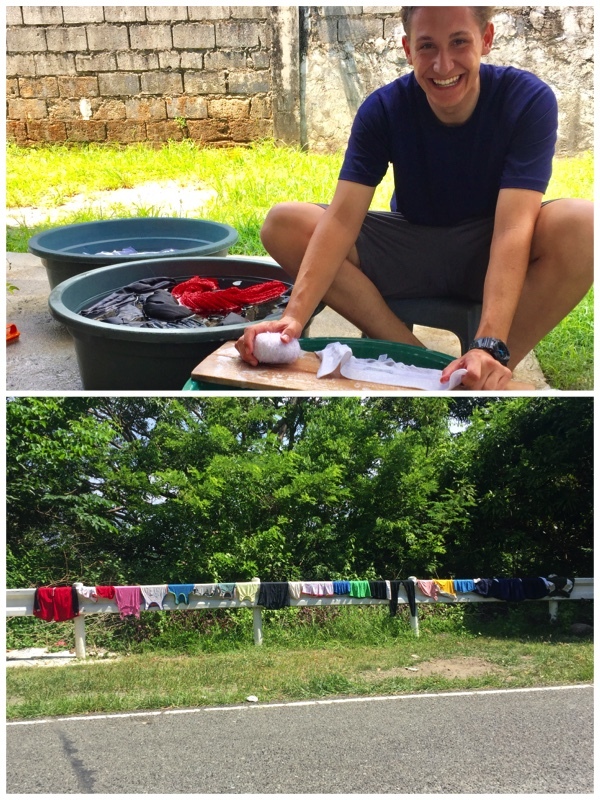 We found him doing laundry and had to get a picture of laundry in action. 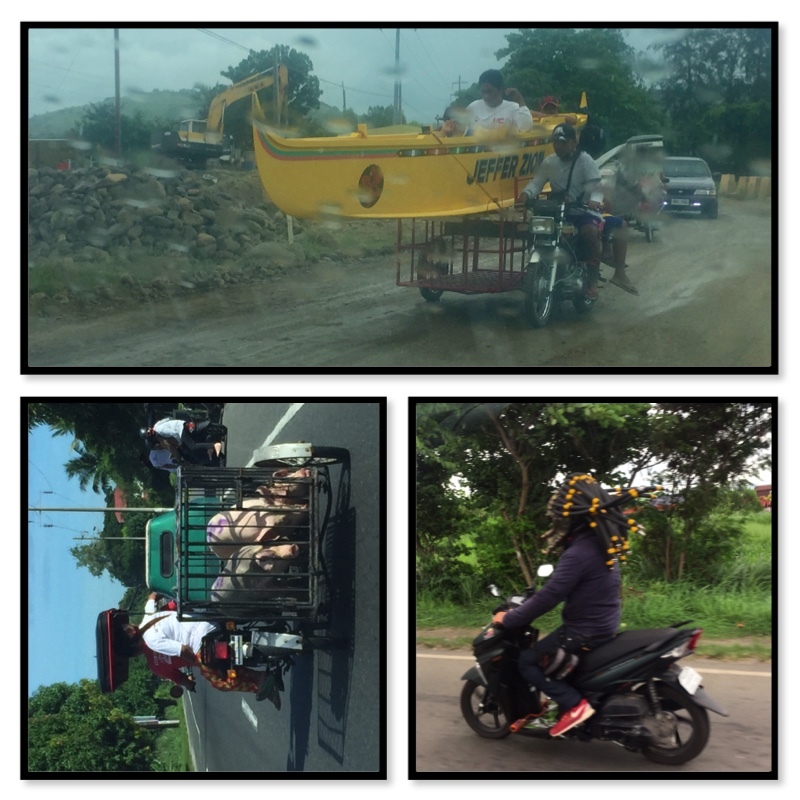 The second picture was captured as we were driving on the highway the same day. When we stopped to take the picture of this laundry drying on the guard rails, a woman started crossing the road to protect her clothes, I believe. It was the sunny side of the road and her clothes needed to get dry!!!!! We did meet President and Sister Lacanienta this morning! We are anxious to get to know them and work with them during our last few months in the Philippines. We will have to share pictures next week after our week of activities with them. They are going to be so busy this week, but that is what they wanted. We are so grateful for this mission opportunity. We love the Lord; we love the people; we love our missionaries; we love serving! in looking through pictures for the blog this week, it didn't take me long. i'm not a big picture taker to start with but this week was apparently the worst! diane loaded you up last week so that will have to carry you over! this week was filled with three days of zone conferences and a follow-up training for our newest missionaries. we got to see every single missionary which does my heart good. they are so joyful! this is a picture of an 'instant choir'. we take a break after lunch and anyone who wants to sing can join in ... always sweet. the dahle's don't usually join in but i think they chose to because this was their last round of zone conferences. 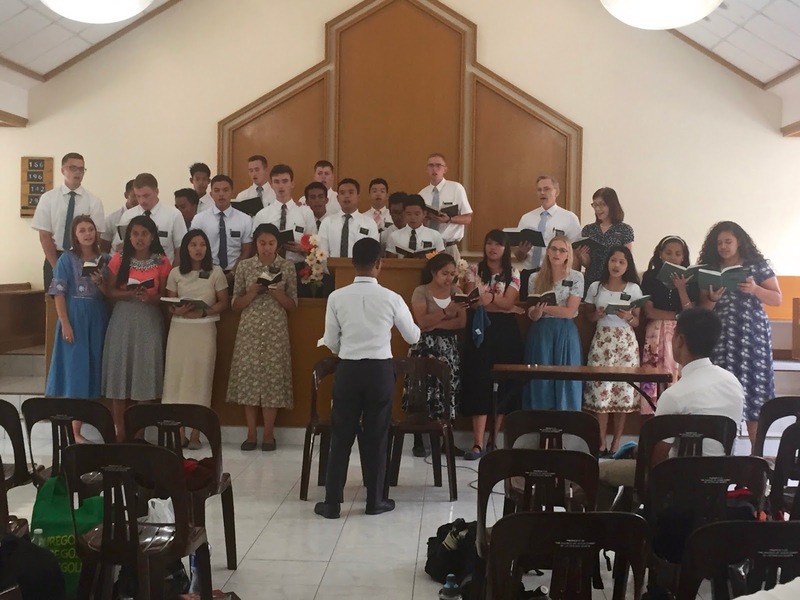 the conference with the last three zones on friday was particularly poignant as they were serenaded with tributes from the polynesian missionaries and then aloha'oe by a hawaiian elder that everyone joined in on. they were clearly moved by the love. it will be hard to say goodbye to them on saturday. 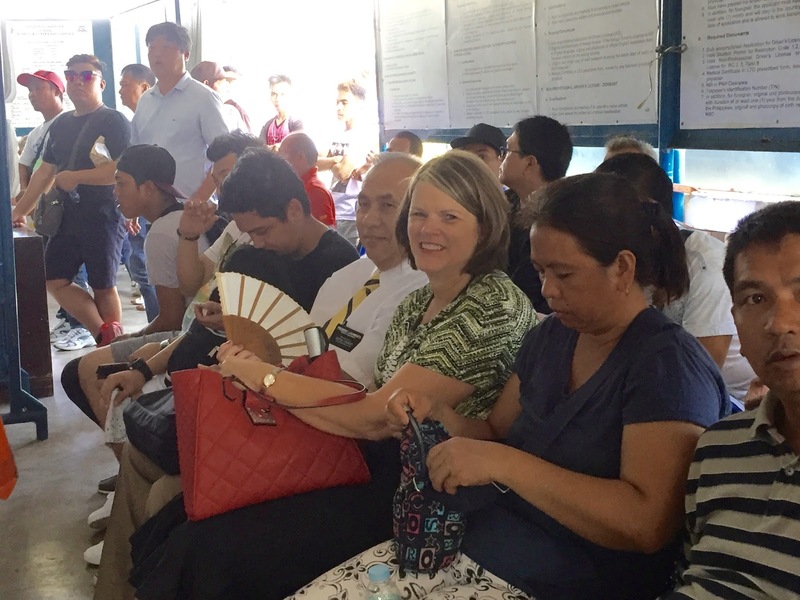 their departure brings the arrival of our new mission president and his wife, ruel and pamela lacanienta. he grew up here in the philippines, was the 60th person baptized here in 1961 and served his mission here but was educated, married, and worked in the states for the last 40+ years. they're fellow texans! we are really looking forward to getting to know them as we work together closely the next few months. and diane just sent me a few photos that i want to include just because the shortness of the people makes me smile. i've always felt a tad 'amazonian' but that feeling is magnified here! love it! we have both talked about the speed at which the end of our mission is approaching. it truly feels like i blinked and here we are. the next four months will be a flurry of activity which won't help the feeling! there's not much that compares to this experience and i wouldn't trade it for the world. Time marches on...and sometimes it feels like it is sprinting! President and Sister Dahle have 2 weeks left. Then, I realize that we have about 4 months before it is Donna and I that are packing and saying good-bye to this country and people that have a section of our hearts! 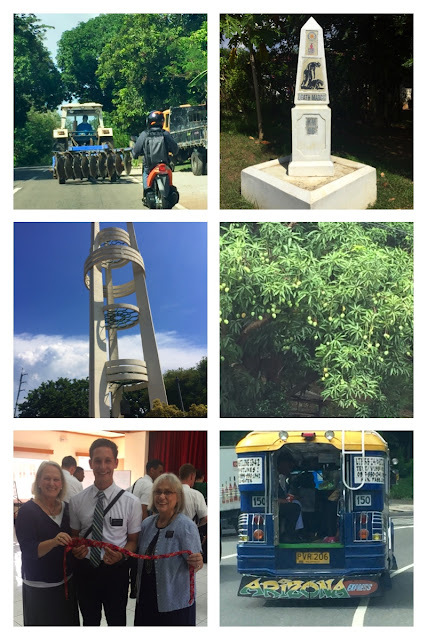 If you follow me on Instagram, you know that we had a senior missionary trip to Manila and the temple. This doesn't happen near enough, but I am so grateful that it does happen! Donna missed this trip, but we know she was where she was supposed to be. Here are some pictures from that day: 1) a trip to the American Cemetery. There are fields of white crosses each representing an American soldier that died fighting in the Pacific between 1941-1945. Then there are walls and walls with all the names. This was a very sobering experience. I am so grateful for all who serve to preserve our freedoms. 2) These cute Filipino sisters wanted a picture with all of us 'white Americans'. This happens everywhere we go. Parents will even ask if their child can get a picture with us. We are the novelty. 3) I love this sign on the expressway in Manila, "an exciting ride is just ahead". It is a reminder to wear your seatbelt, but has so much more to its meaning! 4) The senior missionaries on the temple grounds. Notice the 'fire' tree full of bright orange blossoms. 5) An lastly, a picture of the Manila traffic and a 'vender' selling his goods as he walks through the cars on the expressway! At the office, we often have 'brown outs' as they call them. The electricity is off for a period of time...minutes or hours without warning. This time, we were actually told ahead of time that we would be without power for two 9-hour days while they worked on installing new electric poles on the highway next to the office/apartment. I was very pleased that I could prepare. I hate when I am caught off guard in the middle of my computer work! There is no way I wanted to stick around during this time. When we don't have electricity, we don't have water because our pump is an electric pump. That means no water to wash or flush and no power for computer, lights, and air conditioning. I had to take this picture of the worker on the pole before I left the office. Notice the ladder at the bottom of the pole and the worker at the top attaching wires. I didn't see how he climbed up there! This cheesecake stop was just one of the things I did during my escape from the office. Donna and I were introduced to this wonderful Filipino cafe that not only makes great food but also cheesecake and cinnamon rolls like home! This is Sister Dorosan, me, Sister Secjadas, De Oro, and Cayanan. I visited their apartment and they had just finished their weekly planning and lunch. I thought it was time for a treat! They were very willing to go with me, and I'm grateful that I was able to share some more time with them. 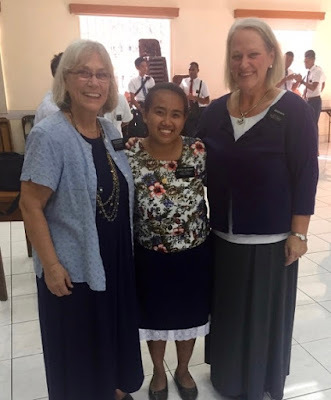 Sister Cayanan is one of our missionaries that went home this week. These are our delightful Office Elders!...Elders Tupou, Abala, Spring, and Poulsen. They only work in the office a few hours a week, but we love our time with them! 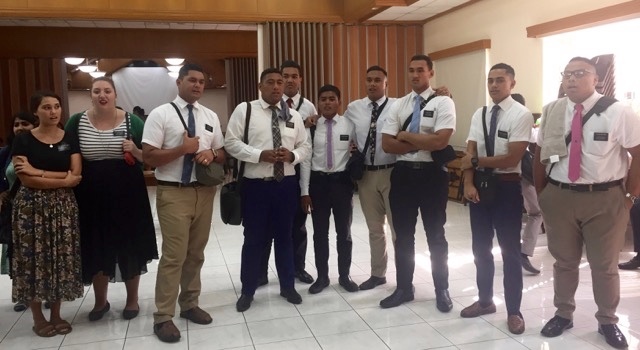 Transfers happened this week and two new elders took the place of Elder Tupou and Poulsen. It is always sad to see our elders leave, but they aren't far away this time. Rainy season is officially here. I love the hard rains when I don't have to be out in it! Rain means flooding around here. We have a reminder of this as we drive on the highway and see the flood gauges I showed in my last post. Today, I was reminded that "if we aren't working today, we aren't preparing for tomorrow". When I look at this in the religious sense, I know that I need to work every single day to make it/me better than the day before! I am grateful for my friends and family that set such great examples for me. Today is Father's Day. Donna and I had a wonderful example of faith, hope, charity and unselfishness from our father! We miss him. i had a great three weeks with the jensen's in norway but it felt good to come home to the philippines last night. i am so happy to report that lauren continues to astound the doctors with her miraculous recovery! we are so grateful for all the prayers on her behalf ... they were truly answered! as a result of her stroke, the doctors expected her to have difficulty with language, vision, balance and memory but she did not experience any of that except for the first few days after the stroke. the only lingering effect is that she gets fatigued easily. she is doing a great job of trying to comply with doctors orders to rest as much as possible but it's been a real struggle for her as she finds it difficult to sit still! the time flew by but i am grateful i was able to be there to help with anything she, christian, or the girls needed. one activity that is always on the agenda when i come to visit is playing 'hair salon' and i am posting proof that the tradition is alive! 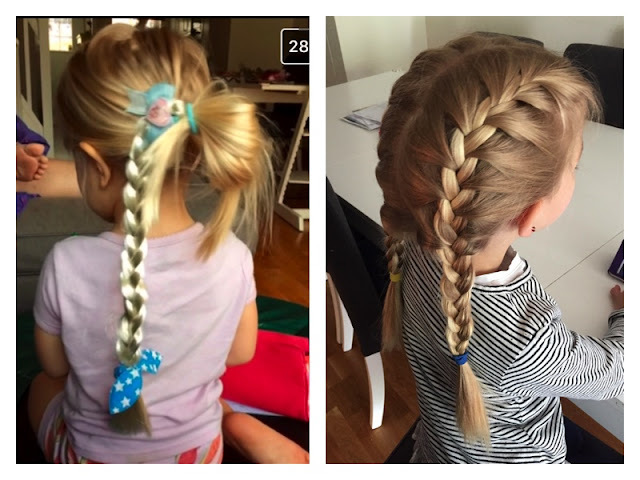 while braids were the order of the day, i did madeleine's and madeleine did stella's, when it came time to do mine, madeleine the hairdresser said my hair was too short but she would do what she could! 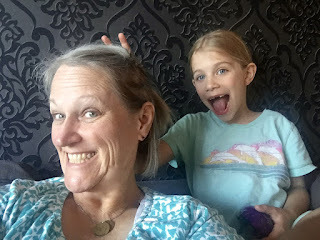 the mission is always busy, but more activities were crammed into the 3 weeks i was gone than have ever been scheduled in any 3-week period, EVER! i missed so much i can hardly believe it, but i was where i needed to be, plus, as a bonus, i got to be there for stella's third birthday! 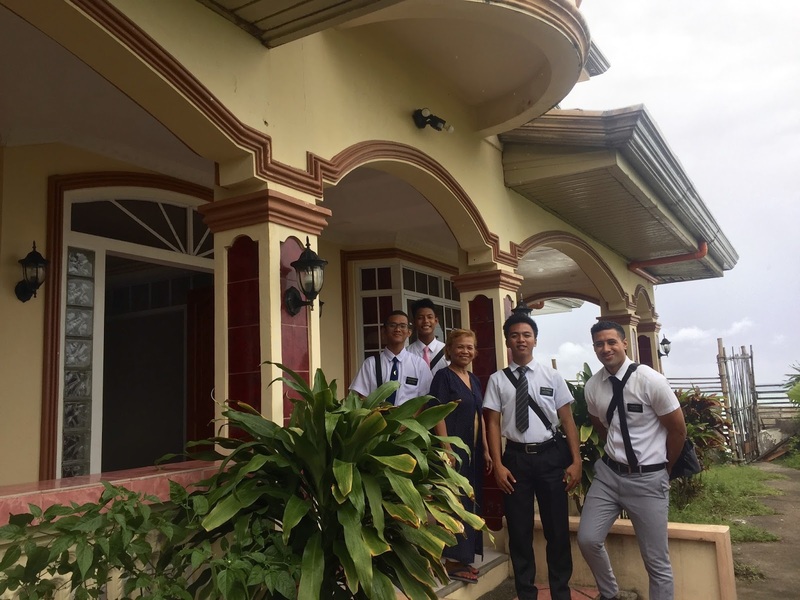 i got home last night and had a restful sabbath attending a special broadcast from salt lake city just for the philippines with talks from sister oscarson, elder robbins, elder bowen, elder ardern and elder bednar. it centered me and i feel ready to jump back into the work tomorrow. IT'S TRANSFER WEEK AGAIN!! my favorite! and the countdown to our mission presidency changeover rolls on. there is so much to be done. while the day to day work is sometimes daunting, there's just an excitement in the air on a mission. it truly is the Lord's work and i am grateful every day for the love and blessings my Heavenly Father bountifully gives me. 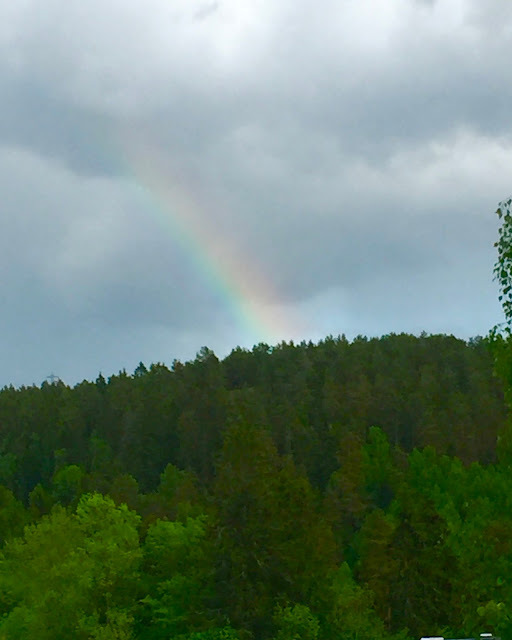 this sight out of the jensen's window the day before i left just reassured me that He was mindful of us and all would be well. prayer and faith are tangible. At 10:30am on Sunday, June 4, our Olongapo District became the Olongapo Stake!! 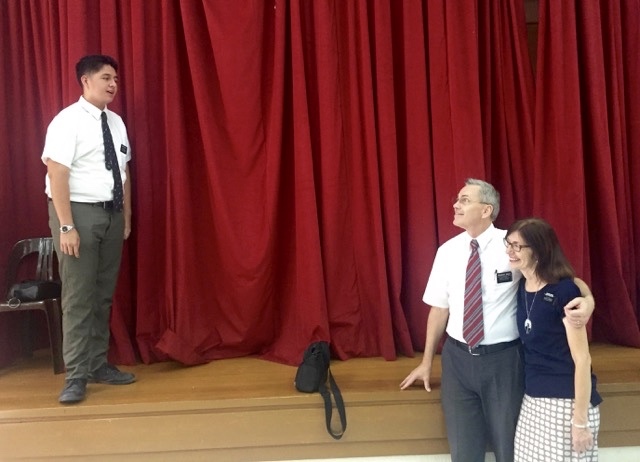 Elder Evan Schmutz presided over the two day conference with Elder Merdegia assisting. Years ago I witnessed this happening in Oklahoma City, but I was too young to remember our Oklahoma City Stake formed. This was amazing to feel the power and strength of the spirit in the room. Our new Stake President was sustained along with his counselors. Then, one by one, each Branch stood as their new Bishop was announced and sustained. The rest of the Stake and Ward leadership positions will be put into place as quickly as possible in the coming weeks. A Patriarch will also be named for our new Stake. Elder Schmutz encouraged those adults and young adults who do not yet have their patriarchal blessing to be ready to receive it. Sister Dahle, our Mission President's wife, had the privilege of entertaining the wives of the two visiting seventies on Saturday before our evening session of conference...and she included us senior sister missionaries! When we have visitors, we go to Ocean Adventure Park for shows and the fish spa and then Camayan Resort to eat on the beach! We had fun getting to know each other! Fun at Ocean Adventure Park! 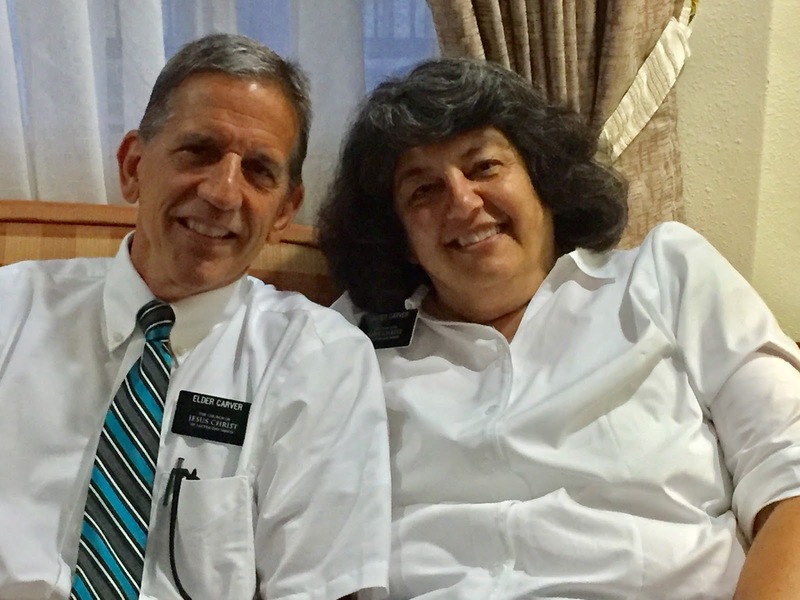 President and Sister Dahle will be released on July 1 as we receive a new Mission President. 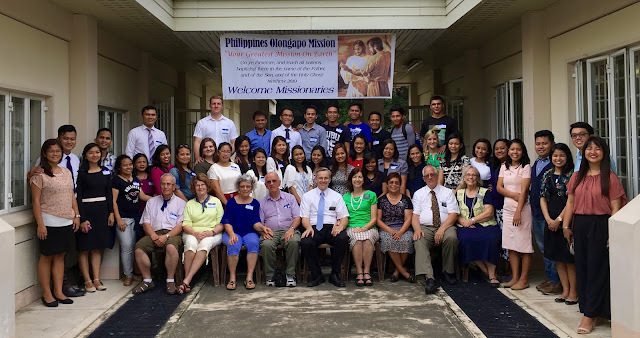 Because the Dahle's are from the USA, they won't have the opportunity to see many of their Philippine missionaries again. 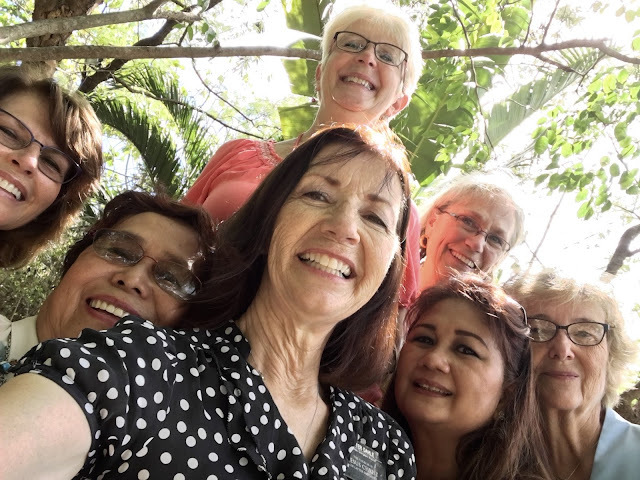 A Mission Reunion was planned and happened last week. The venue was changed to the church building right by the office. That made it very convenient for me to run over at different times during the day and still get my work done. 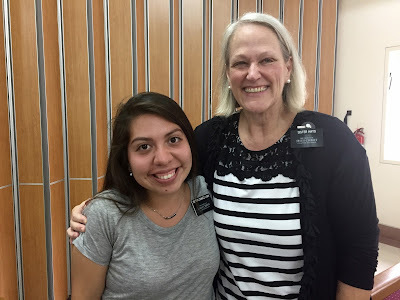 I knew most of the missionaries that came; I was surprised at that. The missionaries all looked soooo good! The two weeks that Donna has been gone have been very busy and full of activities!! Donna left on Saturday before our departing missionaries left on Monday and our new ones arrived on Wednesday. I know she hated missing this week because it is one of our favorites! Our trainers are on the top row!! Two weeks ago, I talked about this transfer and how hard it was going to be for us! The Elders that were serving in the office, and were our Trainers when we arrived last April, finished their missions!! I jumped in this picture so that I could have one with my trainer! I love these missionaries!!! 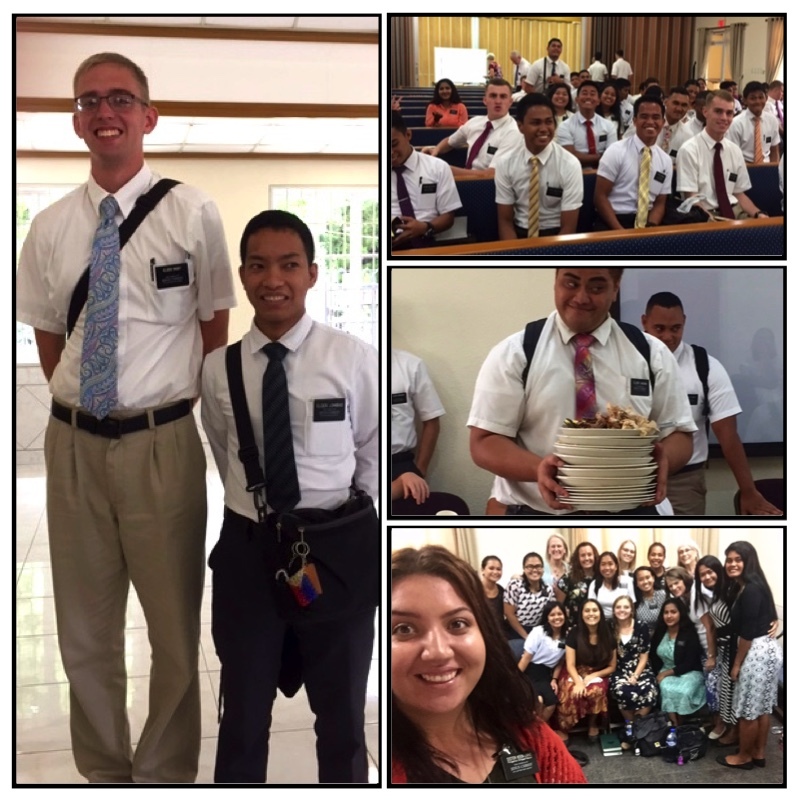 It just gets harder and harder to see missionaries go home because I have had longer to get to know them! We have another transfer in one week!!!! It was moved to 3 weeks instead of 6 weeks because of the transfer of mission presidents on July 1. We had an auction last week. We are trying to clean up our storage areas and get rid of all our surplus 'junk'. I loved watching the purchasers load up their goods and drive away...not in trucks. Take a look.....it makes me smile! Donna missed something else!!! I sent her this screen-shot from my phone. 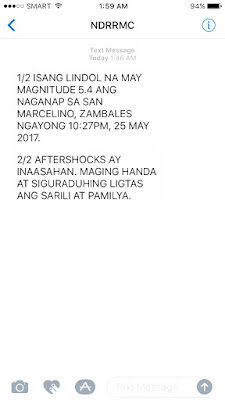 For those of you who don't read Tagalog, this says that an earthquake of 5.4 magnitude is going to hit San Marcelino at 10:27pm...prepare!!! Also notice that I received this emergency text notice at 1:59am!! It doesn't matter, thank goodness. There was no damage to my building. I was in the middle of texting my other sister when it hit. Usually, they are so quick that I don't realize what I felt. This one was much stronger!! I was in the bedroom and everything was shaking, even the built-in closets. I knew what was going on this time!